The state of Madison Metro bus stops may not garner the kind of media attention that a $30 million price tag for a new storage facility does, nor might a nicely endowed bus stop cost even half as much as one new off-street parking stall—let alone a few yards of asphalted street—but bus stop conditions can attract or turn off potential riders. Bus stops speak volumes to what a community really thinks of its transit system, how it prioritizes transit in its budget, how it allots Tax Incremental Financing funds and how it makes land use decisions. Is the stop a mere post in the ground where people must wait for the bus by standing in the wind, rain, snow and dark? Or can they wait by sitting in a sheltered, lighted, even heat-controlled area? Does the stop have schedule information that tells riders when their bus is coming? Is there a trash receptacle nearby? Is the area cleared of snow and ice? Can it be accessed by someone needing a curb cut and sidewalk? Is it designed for all-door boarding? Are bus riders being told that society appreciates them for their frugality and low carbon footprint, or are they being told the opposite? Does one honestly think that people choose to wait at an unsheltered stop if they could travel more comfortably some other way for a reasonable cost? In March of 2018, researchers at the University of Utah released an unusual and important study that tracked the result on ridership of bus stop improvements in the Salt Lake City area. The authors of the report expected to find more attention to the notion of a measurable return on investments in bus stop amenities. They did not. Much closer to home and following on the heels of the Utah study, our own Madison Area Transportation Planning Board issued an important study of our bus stops. And echoing the Utah's study finding of inattention to the "fiscal and ridership impacts" of capital investment in bus stop amenities by most transit agencies, the board reported that Madison "Metro has had a simplistic method for identifying needed bus stop amenities." The board’s report then documents the numerous problems with many of Madison "Metro’s 2,112 active transit stops." Given the general guidelines contained in the 2013 Transit Development Plan, just creating a complete inventory of bus stops is one of the challenges. But then, instead of exposing the TDP's faulty logic in setting guidelines for bus stops amenities, it compounds the error. The TDP amenity guidelines include: 1) All bus stops should have signs and a concrete platform at the front door; 2) Stops where at least 15 people board the bus on a daily basis should also have benches and schedule information; and 3) Stops where at least 30 people board should have shelters. The guidelines are faulty because they are reactive rather than proactive or creative. Bus riders are attracted to stops with more amenities, not the other way around. Why should they stand at an exposed stop that might (or might not) get a shelter after five more years? Anyone who has ever contemplated using the bus has thought about this but it is precisely this kind of unimaginative thinking that pervades Metro’s management, which aides and abets its downward spiral in service. That is one reason the Utah study is so valuable and unusual, even documenting increased ridership resulting from a proactive approach to bus stop amenities. Instead of exposing the illogic however, the Transportation Planning Board's recent report on bus amenities double-downed on it, adding a ridiculous "transit density" criterion to the already flawed guidelines. It suggests that a stop located in a "single use" or suburban setting should require a daily boarding of 20 to warrant having a bench, and 30 daily boarders to have a shelter. In contrast, a stop located in an "mixed use" area better designed for transit should require 35 boardings for a bench and 50 for a shelter. And even worse, a stop in the "transit dense" downtown-campus area should require 75 boardings fo a bench and 100 for a shelter. Another contradiction also appears in the board’s report. To procure additional funds for amenities at bus stops the board’s report suggests the following: 1) Offer advertising at benches and shelters, and then invest the revenue back into more bus stop amenities; 2) Offer city placemaking grant funds to make neighborhood bus stops simultaneously more artistic and comfortable; and, 3) Offer some of Metro's Surface Transportation Block Grant (STBG)-Urban program funds for bus stops amenities instead of using these funds exclusively for the purchase of buses. What’s missing from the Transportation Policy Board's report is mention of Tax Increment Funding separate from Bus Rapid Transit. But any transportation-related capital expense near or in a TIF-designated district is eligible. City engineers and others have used TIF money to resurface roads and finance huge parking lots. If the economic role or economic development potential of public transportation were honestly given its due, more investment would be made in much less expensive bus stop amenities. And using transit in Madison could become a more attractive and possible way to travel. 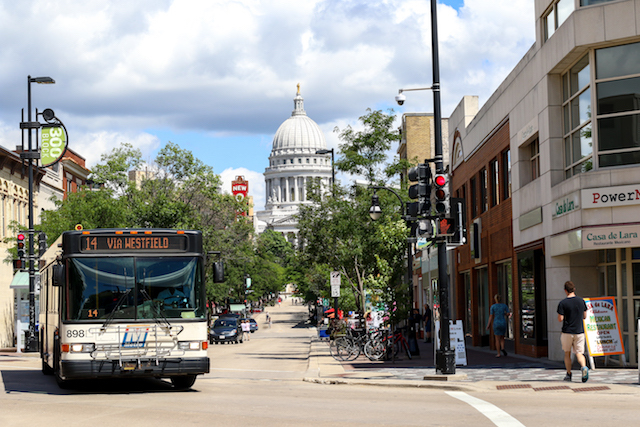 Here’s your chance, Madison, to share your poetry stories about your favorite Madison places with the thousands of Madisonians who ride the bus every day. Madison Metro Transit and Madison’s poet laureate, Oscar Mireles, are inviting members of the community to send short poems, haiku, prose poems, or excerpts from longer poems, 3–15 lines total, to the 2019 Bus Lines open call for poetry.